Don passed away in 2008 after a brief illness. 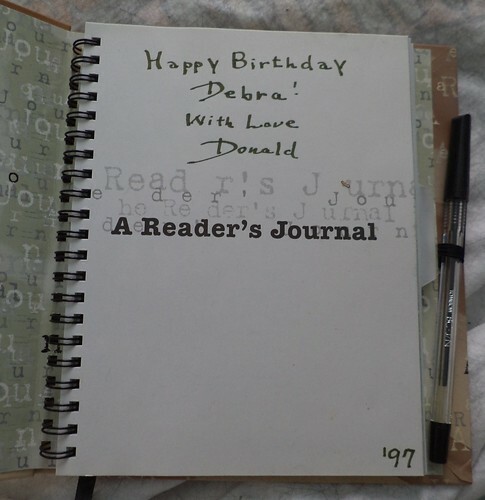 I had forgotten I had this journal until I had to dismantle the stacks of books to get the next book to be read. We'd known each other since 1988, thanks to my editing a newsletter for an organization. We became closer friends, known only through correspondence, a year later and we maintained that correspondence up to his death. He was an older gentleman with a daughter around my age. He wasn't a father figure. Rather, he was a confident, a chum, a pal, but mostly, a very good friend. I got a letter from his daughter announcing his death on the day I had to be at a meeting, to actually run the meeting, so I couldn't call and say, "I'm not coming." When I came home, I cried. He had given me a photo of himself only 6 weeks earlier. He told me once, in 2005, that he would be willing all his books on writing and grammar to me. I was horrified when, in late 2006, I received a box containing these books. I sat down and sobbed. I hadn't heard anything about his well-being. A letter came the next day saying he hadn't passed on but felt he wanted to give me all his books now rather than later because he knew I would appreciate them. I still have them and they are still in the box he sent. He also saved all of my letters to him and, in early 2007, sent them back to me. "Some day, when you're writing that novel, you might want these to use in creating a character. Plus, you can see where you've come from where you were." I still have that box, too. The books are outdated but neither item is something I want to be rid of, not just yet. I've never used this journal. I have quite a few book/reading journals and sticking it in the stacks of books waiting to be read guaranteed that I'd forget it. I'm not sure quite what I will do with it now that I've found it again. I used to keep scrupulous track of the books I've read, but that's fallen by the wayside. I'll hang onto this. It's a memory of a good friend.